Bronze. Ca. mid-5th century BCE. Height 6.7 cm. Width 6.4 cm. Solid-cast by the lost wax process and considerably cold-worked. Condition: granular greenish patina with spots of red, varying shades of green and azurite. Rivet through left wrist of left figure still in place: the other two on volutes missing. Two wrestlers in the initial phase of a contest are vying for an advantageous hold: one has seized the initiative, grabbing the wrist and neck of his opponent who is doing his best to thwart the attempt. They are both functional and highly ornamental as they stand on a plinth, decorated with a row of pearls above ovolos, which surmounts a sort of two-voluted capital resting on an animal claw. The group was one of the three feet of a cista. The Etruscans were wont to represent all sorts of scenes, among which interpretations they illustrated Greek myths or rather their understanding of them. 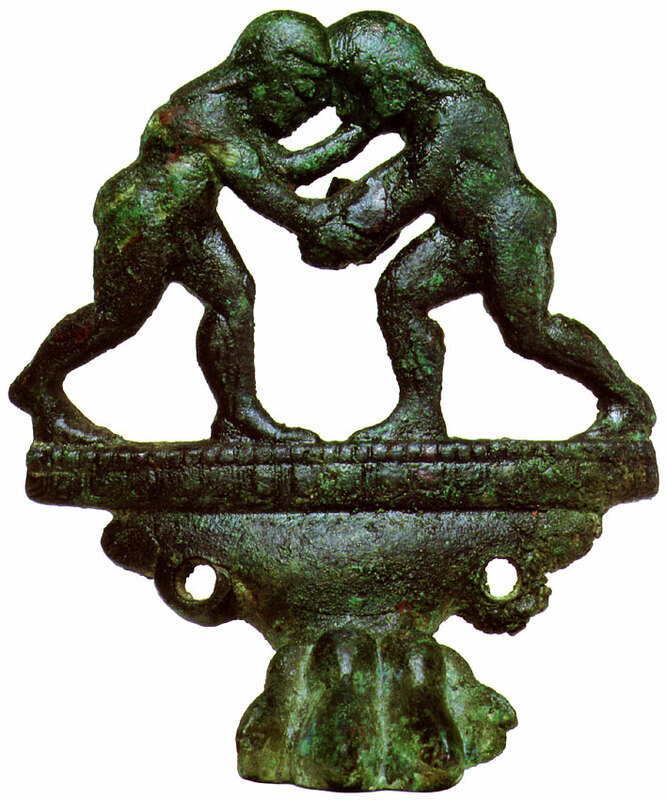 In the present example we simply have two wrestlers, whereas several comparisons have two figures, Herakles and Apollo, fighting over the Delphic tripod1. 1 Paris, Bibliothèque Nalionale B.B. 582, ascribed to Vulci (M.—A. Adam, Bronzes étrusques et italiques, Bibliothèque Nationale, 1984, no. 27 pp. 28—29) (one foot): Vatican, Museo Gregoriano 12743—12745 (F. Jurgeit, Cistenfüsse. Etruskische und Pränestiner Bronzewerkstätten. Le Ciste Prenestine II (1986), pp. 26—27, K 3, 4—6, pl. VII a-c), found in Vulci (the complete set) and many others. © 1993. Photo, text: Olympism in antiquity. Olympic Museum Lausanne. Bertelsmann UFA. Industria Gráfica S. A. Barcelona, 1993, p. 114 cat. no. 57. © Photograph — P. Goetelen (Geneva).